Sleazy (Male) is from Nevada. He is 26 years old and has been riding trains for 9 years. He met Dizzy (female shown) about 3 ½ months ago in Texas. They are a couple. When I got to them, they had been in Baltimore, they had been her for 1 week. Sleazy didn’t have many kind words for his first trip to Baltimore. I asked him what he didn’t like and he said the city sucked too many drugs, no money and they spoke a different lingo that he didn’t know. I asked Sleazy what made him start riding the trains – he said he used to take his $5 school lunch money and buy 40’s (40 ounce beer) and go down to the area where the train riders were located. They told him the stories about seeing the country. One day he just never went back to school. The larger dog is named Syd and the puppy they recently found on the tracks in Gergia is named Biggie Smalls. Dizzy is the female below. She is 22 years old. She has been riding for about 5 years. She has a high school diploma. She loves riding the rails as much as Sleazy. Neither sees an end in sight for now. I asked her the same question I asked every train rider, How often do you talk to family. Dizzy, when she can; Sleazy is once a month. Once a week and once a month seems to be the standard answer. Before Dizzy started riding trains, she was homeless. 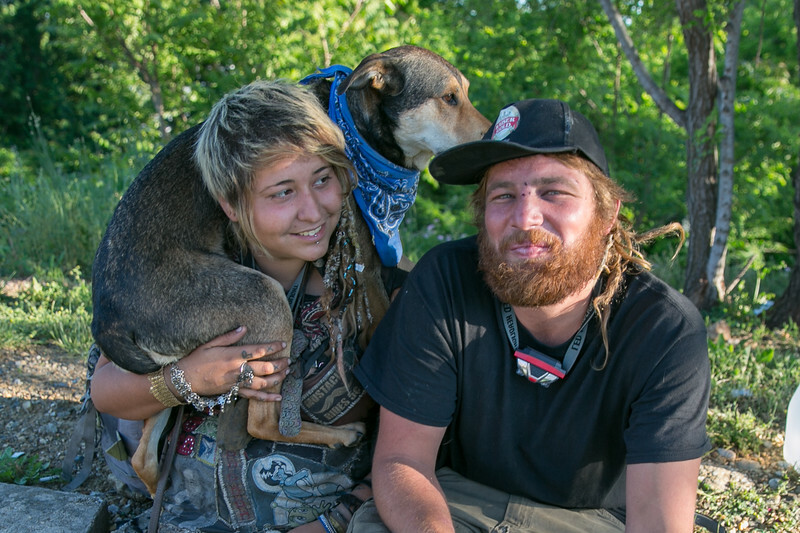 When I found these two, Dizzy was cutting up a backpack they found in Charleston, SC. It was a nice backpack but it had hole in it. She was cutting it apart to save the waterproofing sections. She said she will use the sections to fix their clothing.